Personalized Mala beads by Fleur de Lune. Mala beads are a set of gemstones, wood or seeds that have traditionally been used in prayer and meditation. Sanskrit: mālā "garland." 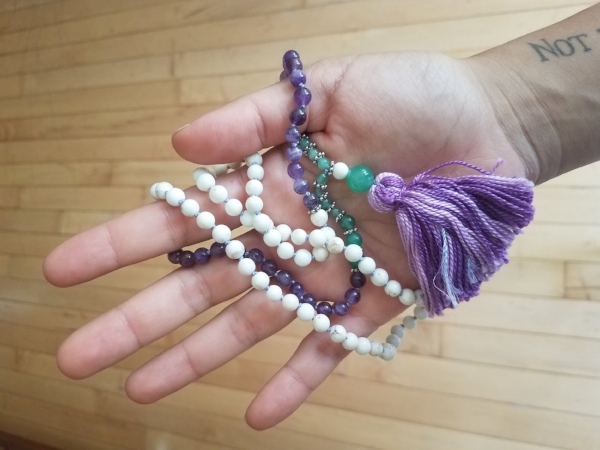 You don't have to be religious or have any spiritual practice, anyone can simply wear them as a reminder of an intention they set for the mala. These malas are also great if someone is seeking to nourish their mind, body and soul. These authentic pieces are handmade by Aude, of Fleur de Lune, and blessed with an energy reading by celebrity tarot card reader Angie Banicki. These malas are unique for every individual and made to order. No one mala is alike. Prices start at $150 and vary based on your preference. Your personalized mala is created based on a short questionnaire that will determine the variety of gemstone you can choose from. These stones are believed to offer different healing qualities. For example, rose quartz is believed to open the heart chakra, lava is thought to encourage grounding and strength, and amazonite is associated with helping us follow our dreams. Choose your path & set your intention, the universe is waiting!